Easy money! 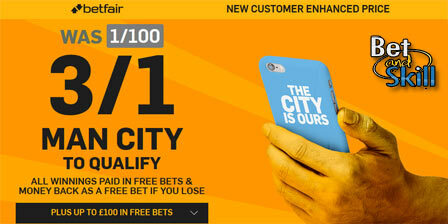 3/1 Man City to qualify in Champions League at Betfair (was 1/100)! Man City are 3-1 up going into the second-leg against Dynamo Kiev and with them at home tonight, you can get 3/1 for Man City to qualify at Betfair (was 1/100)! Plus, money back if you lose! Manchester City’s quest to win the Premier League title may well have come to an end this past weekend, but Manuel Pellegrini’s side should advance in the Champions League on Tuesday night when they host Dynamo Kiev in the second-leg of their last-16 tie thanks to a 3-1 away win in the first leg in Ukraine. Read below how to get 3/1 Manchester City to qualify! Place your first bet (max £/€10) on Manchester City to qualify at the current Sportsbook price. If your bet wins, Betfair will pay out at the quoted price immediately. They will top up your additional winnings within 24hrs. - Offer is reserved to customers in the UK or Manchester City. - This promotion is only open to new customers that sign up using bonus code ZFBC89 and place a pre-match bet on Manchester City to qualify for Champions Leagueat the current market price (max. stake £/€10). - Bets placed using free bet tokens do not qualify. - You can qualify for a maximum of one bet on the enhanced price per customer. - Only your first bet placed on the event is eligible for the enhanced price. - Exchange bets and bets as part of multiples are not included in this promotion. - Betfair will payout your winnings from the current market price immediately. - Betfair will payout any additional winnings, as free bet tokens, within 24 hours IF your selection WINS. - Selections in permutation multiple bets (Patent, Yankee, Lucky 15 etc) do not count. - If you place a bet AFTER the event has already started your bet does not qualify. - If you Cash Out on your qualifying bet, you will be excluded from this promotion and will not receive the bonus winnings. - You will be credited your bonus winnings, paid as free bet tokens, usually within 24 hours after the event has settled. - Tokens are vaild for use on ANY Sportsbook market up to 7 days after receiving. - Customers will also now receive money back as a free bet if their enhanced price loses, max refund £/€10. - For every 4 x £/€10 bets (singles or multiples/win or lose) placed and settled on independent selections (min odds 1.4) you will receive a bonus £/€20 free bet. Max bonus a qualifying customer can receive is £/€100 in free bets. "Easy money! 3/1 Man City to qualify in Champions League at Betfair (was 1/100)!"